Hmmmmm…..are they moving to platinum because they lost control of the gold? Now, putting the sheer legal idiocy of the proposal aside, and CNBC’s John Carney has written a good article about why it is indeed, legal idiocy, the simple reality is that for this retarded idea to work, there has to be some justifiability, or even remote credibility of the “legal tender” backing the value. Sadly as the chart above shows, there can’t possibly be such justifiability. Remember, as we said, the chart above is indicative of reality at today’s prices. So if the Treasury plans on literally coming up with ridiculous laws, what is there to prevent it from merely coining a one ounce, or half an ounce, or one gram Platinum coin and assigning it the value of $1 trillion. Sure it can. There is a problem with that, however: it is called currency devaluation and is also what FDR did with executive order 6102 when he confiscated America’s gold – he basically devalued the US Dollar by well over half overnight (which, for all those curious, is the endgame in the current depression also, but we’ll cross that bridge when we get to it). 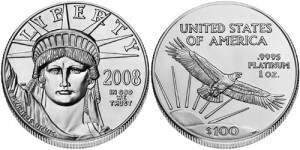 In other words, when one strips away with all the rhetoric, all the advocates of this insidiously stupid idea which gets a new life every time there is a debt ceiling crisis, are doing, is arguing for a massive devaluation of the dollar: because for the trillion dollar coin idea to be even remotely plausible, the price of Platinum, and by implication the entire precious metals complex, would have to go up by a factor of some 1,100. It also means the value of the paper US currency would have to go down by 1,100. Which, by the way, is precisely what all those who wish for the Fed to continue funding America’s unprecedented spending binge, which can never be satisfied by taxes alone, are hoping for. And of course, they will eventually get it.